The Young Playwrights' Guild (formerly the Student Advisory Council) was formed to foster talented young playwrights and enable them with the skills to write a full-length play over the course of a school year. The Guild will also serve as an advisory council to the YPT board. Guild members will confer with professional artists, experience local art and write about what resonates with them. Comprised of 6-12 current and alumni participants of YPT's Young Playwrights' Workshop and New Play Festival, the Guild meets every other Tuesday from September to May. Guild member candidates are recommended by YPT staff and teaching artists, based on their successful participation in a YPT program and their strong interest and engagement with YPT’s mission. Congratulations to the Young Playwrights' Guild on a successful final sharing of their one-act plays! See highlights from the presenation here! The teen playwright performers of Young Playwrights' Theater's Student Advisory Council explore unique perspectives and new ideas through seven original plays chock full of humor and wit! Tickets to Student Advisory Council (SAC): Uncommon Views are Pay What You Can/Voluntary Contribution. We know that not all our guests will be able to contribute, but if you can, please do so at the door! The teen playwright-performers of YPT's Student Advisory Council present a light-hearted exploration of character, identity and - yes - hot dogs. Join the Council for their annual staged reading and celebrate the unique, hilarious voices of Greater Washington's young playwrights! Sponsored by Ben's Chili Bowl and Haute Dogs & Fries. Buy raffle tickets at the show to win great prizes from these two delicious restaurants! 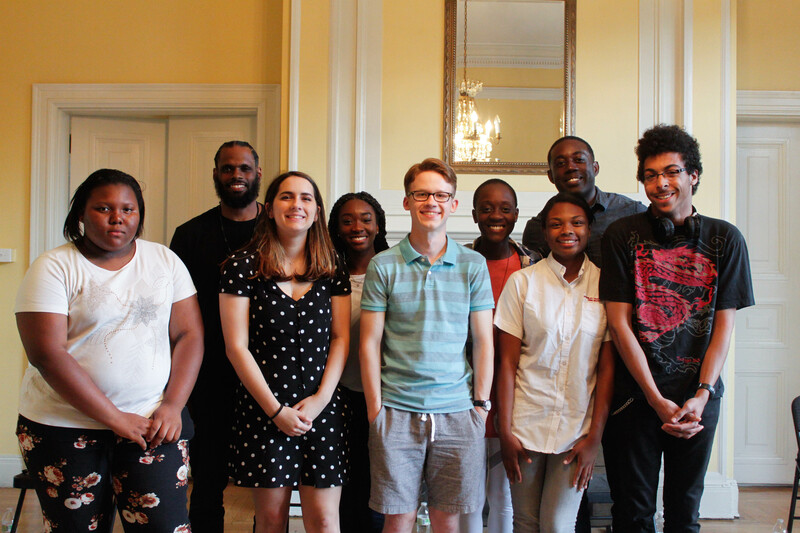 In late 2014, former YPT Teaching Artist and longtime supporter Adrienne Nelson approached the Student Advisory Council with a unique and compelling project. She and her team were in the process of bringing One in the Chamber, a new play by L.A.-based playwright Marja-Lewis Ryan, to DC, and they wanted the Council to get involved. Inspired by a 2013 New York Times article, "Children and Guns: The Hidden Toll", One in the Chamber takes us through the aftermath of a horrific accidental shooting. The play examines the tragic impact gun access has on one family and uses their story to discuss larger issues of gun ownership and youth gun safety. Seeking young people's perspectives on gun violence, the Chamber team invited the Council to write response pieces to the play itself. They did, and on September 6, 2015 - closing night of the show - professional actors will read two of their pieces as part of a talkback that will also feature Congresswoman Loretta Sanchez, the authors of the New York Times article and community organizations from both sides of the issue. Click here to join the Student Advisory Council at this important and impactful event! The Council, the One in the Chamber team and all of us here at YPT appreciate your support! Let us help keep this urgent conversation going and seek tangible change through creative expression. Eight talented young playwrights perform a live reading of their original play, Stage Fright. Stage Fright explores the topic of fear through hilarious and poignant vignettes, culminating in a Choose Your Own Adventure-style performance where the audience decides the ending! Stage Fright is presented by the Student Advisory Council as a fundraiser for Young Playwrights' Theater. Recommended for ages 13 & up due to strong language. Click here for a full album of photos from Stage Fright! Seven young playwrights present a reading of an original play that explodes myths about teenagers in an unflinching and hilarious evening of theater! Click here for a full album of photos from Dear Mr. Stein!